All of the code and instructions for getting this application running in your development environment are in the QuoteDiscountApproval sample app. This project was a ton of fun and I’ve learned a bunch of new things about Android, Gradle, and Salesforce.com which will provide some great fodder for upcoming blogs. So check out the Salesforce Wear Pack for Android Wear and stay tuned for more blog posts on these topics. Adobe AIR provides a consistent platform for desktop and mobile apps. While consistency is very important there are times when developers need to extend beyond the common APIs. This article will walk you through how to integrate AIR for Android applications with other native APIs and functionality in the Android SDK. It covers three common use cases for native extensibility: System Notifications, Widgets, and Application Licensing. Before getting started, a little background will help. Android applications are distributed as APK files. An APK file contains the Dalvik executable (dex), which will run on an Android device inside the Dalvik VM. The Android SDK compiles a Java-like language to dex. AIR for Android applications are also distributed as APK files. Inside of these APK files is a small bit of dex that bootstraps the AIR for Android runtime, which then loads and runs the SWF file that is also inside of the APK. The actual dex class that bootstraps the AIR application is dynamically generated by the adt tool in the AIR SDK. The class is named AppEntry and its package name depends on the AIR application ID, but it always begins with “air”. The AppEntry class checks for the existence of the AIR runtime and then launches the AIR application. 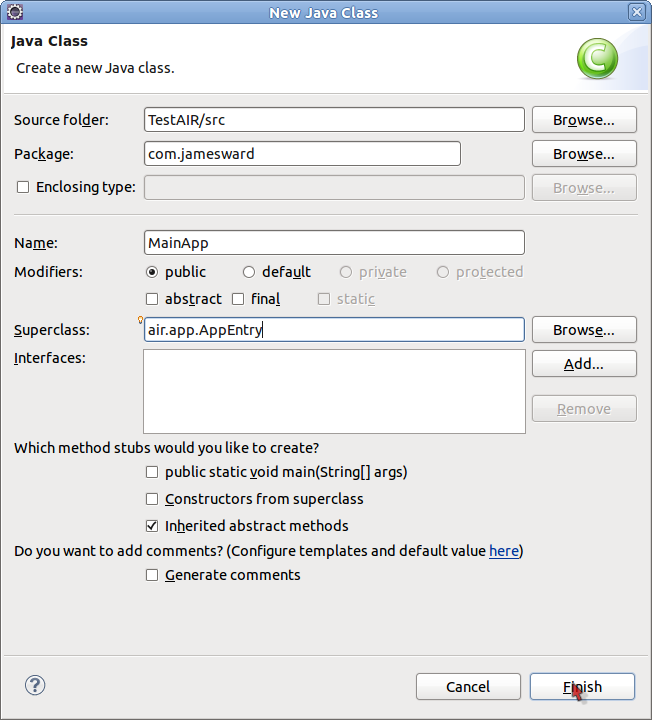 The Android descriptor file in an AIR APK specifies that the main application class is the AppEntry class. To extend AIR for Android applications to include native APIs and Android SDK functionality, you start by creating a SWF file using Flex and then copy that SWF file, the dex classes for AIR for Android, and the required resources into a standard Android project. By using the original AppEntry class you can still bootstrap the AIR application in the Android project but you can extend that class to gain a startup hook. Copy all of the files from the zip file you downloaded into the root directory of the newly created Android project. You will need to overwrite the existing files and update the launch configuration (if Eclipse asks you to). Add the airbootstrap.jar file to the project’s build path. You can do that by right-clicking on the file, then select Build Path and then Add to Build Path. Verify that the project runs. You should see “hello, world” on your Android device. If so, then the AIR application is properly being bootstrapped and the Flex application in assets/app.swf is correctly being run. At this point if you do not need any custom startup hooks then you can simply replace the assets/app.swf file with your own SWF file (but it must be named app.swf). If you do need a custom startup hook then simply create a new Java class named “MainApp” that extends the air.app.AppEntry class. You can also add any other permissions or settings you might need in the AndroidManifest.xml file. Save the changes and, when Eclipse prompts you, update the launch configuration. Run the application and you should again see “hello, world”. This time, however, in LogCat (command line tool or Eclipse view) you should see the “test test” output. Now that you have a startup hook, you can do some fun stuff! AIR for Android applications don’t yet have an API to do Android system notifications. But you can add system notifications to your AIR for Android application through a startup hook. In order for the AIR application to communicate with the native Android APIs you must provide a bridge for the communication. The simplest way to create that bridge is using a network socket. The Android application can listen for data on the socket and then read that data and determine if it needs to display a system notification. Then the AIR application can connect to the socket and send the necessary data. This is a pretty straightforward example but some security (for instance a key exchange) should be implemented to insure that malicious apps don’t discover and abuse the socket. Also some logic to determine which socket should be used would likely be necessary. Save your changes to AndroidManifest.xml. This service listens on port 12345. When it receives some data it checks if the first “int” sent is “1”. If so, it then creates a new notification using the next piece of data (a string) that is received over the socket. That is all you need to do in the Android application. As you can see there is just a TextInput control that allows the user to enter some text. Then when the user clicks the Button the AIR for Android application connects to a local socket on port 12345, writes an int with the value of 1, writes the string that the user typed into the TextInput control, and finally flushes and closes the connection. This causes the notification to be displayed. Now simply compile the Flex app and overwrite the assets/app.swf file with the new Flex application. Check out a video demonstration of this code. Widgets in Android are the mini apps that can be displayed on the home screen of the device. There is a fairly limited amount of things that can be displayed in Widgets. So unfortunately Widgets can’t be built with AIR for Android. However a custom application Widget can be packaged with an AIR for Android application. To add a Widget to an AIR for Android application you can use the default AppEntry class instead of wrapping it with another class (MainApp in my example). (It doesn’t, however, do any harm to keep the MainApp class there.) To add a Widget simply add its definition to the AndroidManifest.xml file, create the Widget with Java, and create a corresponding layout resource. This tells the widget to use the main layout resource as the initial layout for the widget. Next, you’ll need to create the AppWidgetProvider class specified in the AndroidManifest.xml file. This class will display the Widget when necessary and register a click handler that will open the MainApp application when the user taps on the Widget. Run the application to verify that it works. Now you can add the widget to the home screen by holding down on the home screen and following the Widget wizard. Verify that tapping the widget launches the AIR application. Android provides APIs to help you enforce licensing policies for non-free apps in the Android Market. You might want to go read up on Android Licensing before you give this one a try. // Generate your own 20 random bytes, and put them here. When the application runs it will check for a valid license. If the license comes back as valid then the AIR application will start and run as usual. However, if there is an invalid license then the application will set the ContentView to the R.layout.main resource, which displays the error message defined in the “license_problem” resource. To simulate different responses you can change the “Test Response” in your Android Market profile. I’ve wrapped up a generated AppEntry class and its resources to make the process of extending AIR for Android fairly easy. If you are interested in seeing how that is done, I’ve posted all of the source code on github. 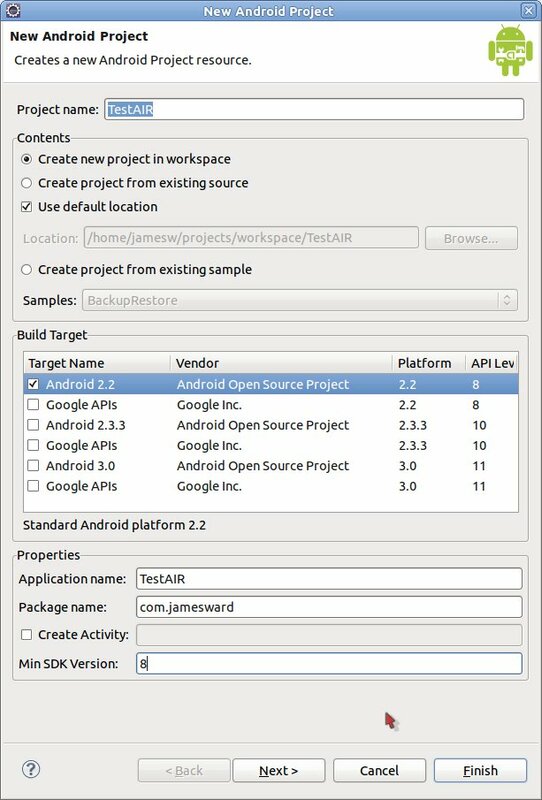 Use the AIR SDK to create an AIR for Android APK file. Use the dex2jar utility to convert the AppEntry dex classes into a JAR file. Pull the resource classes out of the JAR file so that they don’t conflict with the new resources. Use apktool to extract the original resources out of the AIR for Android APK file. Create a single ZIP file containing the airbootstap.jar file, resources, AndroidManifest.xml file, and assets. Now you can simply copy and paste those dependencies into your Android project. Hopefully this article has helped you to better understand how you can extend AIR for Android applications with Android APIs. There are still a number of areas where this method can be improved. For instance, I am currently working with the Merapi Project developers to get Merapi working with my method of extending AIR for Android. That will provide a better bridging technique for communicating between the AIR application and Android APIs. So stay tuned for more information about that. And let me know if you have any questions!